Fly with the world’s most awarded airline to over 60 destinations across the globe, and experience the in-flight service even other airlines talk about. Singapore Airlines operates one of the youngest fleets in the sky and made history in becoming the first airline to fly the Airbus A380, the world’s largest commercial aircraft. 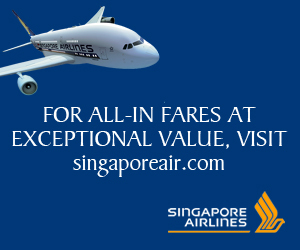 Singapore Airlines offers a choice of four daily flights from London Heathrow, as well as a daily flight from Manchester to Singapore on the world's most largest commercial aircraft. There are then convenient onward connections to destinations across Southeast Asia, Australia and New Zealand right here at Singapore Airlines, a great new way to fly.